The Bestair AirJet 500 is a system for cleaning and disinfecting the ambient air in rooms, such as living rooms, waiting rooms, treatment rooms and, of course, canteens. The filtration performance is 440 m3/h at 100%. The system consists of 5 stages of filtration to purify the air. In addition, the consumption of the filter inserts and the current degree of contamination of ambient air are displayed graphically in the display. 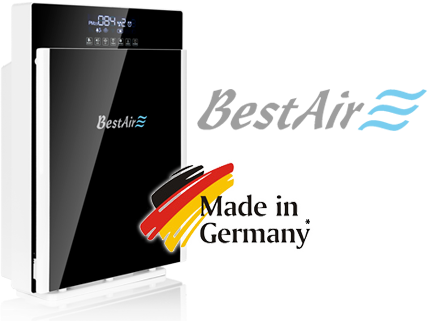 The intelligent system of the Bestair AirJet 500 automatically adjusts the air quality in line with the speed of the machine, so you can enjoy convenient operation of the unit and clean air at the same time. With the built-in dual air quality sensors for measurement and control of air quality (gases and aerosols), air quality can be accurately determined. In automatic mode, the system automatically selects the appropriate speed to ensure a high level of air quality in indoor environments. In today’s day and age, a person spends, on an average, 90% of his time in closed spaces. 65% of this time is spent at home itself. Protecting health from PM2.5 fine dust is becoming more and more important since more than 70% of the population works indoors in offices. Here, the problem is that people are more susceptible to PM2.5 fine dust in indoor areas. Known main sources of fine dust in outdoor areas are smoke and exhaust fumes. Thanks to the installed dual air quality sensors for measuring and checking the air quality (gas and aerosol), you can determine the quality of air accurately. In the automatic mode, the system automatically selects the suitable speed to ensure high quality of air in indoor areas. The Bestair AirJet 500 has a collection of multiple effect filters, such as a HEPA filter, an activated carbon filter and a photo-catalyst filter. In this way, more than 80 pollutants are effectively filtered from the air. HEPA H13 (High Efficiency Particulate Filter) Large, very good filter performance. The performance and the surface are proportional to the network filter. The HEPA filter of the AirJet 500 air purifier is folded several times. The area ratio is thus raised by about 15 and increases the filter effectiveness accordingly to excellent. In a single HEPA filter of the AirJet 500, the net filtration rate is much higher than in the general HAPA filters! The filter has an efficiency of up to 99.97 % . Activated carbon filter Unique structure and efficient absorption of smells – divided into granular activated carbon, activated carbon, activated carbon powder and activated carbon fibres. The characteristics of the molecular sieve are good adsorption and a large surface area, especially for small molecular species such as ammonia, formaldehyde, etc., which have a good adsorption capacity. Modified adsorbent material In contrast to industrial cleaning, civil air purifiers have a simple choice of activated carbon against pollution by formaldehyde, TVOC, ammonia, benzene and gas. The activated charcoal odour filter has a large adsorption area. According to research, the weight of one gram of activated carbon adsorption has a width of 500 to 1500 meters. Since the AirJet 500 uses an activated carbon odour filter weighing 1,900 g, the adsorption area is approximately 1.6 million square feet, similar to the area of 224 football fields. UV lamp By using the UV lamp with a wavelength of 254 nm, bacteria can be killed directly, while an excellent effect can be achieved with the PCO. Organic pollutants (formaldehyde, benzene, xylene, etc.) in the air can be decomposed into carbon dioxide and water, and this can result in the destruction of bacterial cell membranes as well as curing viral proteins, providing strong sterilisation coverage and removing odours. Anion generator Anions, negatively charged ions. Enjoy fresh air after quick cleaning. Due to the high acceleration of the torque of the AirJet 500, you improve air quality and experience real quality of life. The quality of air indoors can be seen on the LCD screen at a glance. The smart sensor automatically adjusts the speed to the quality of air. With the built-in dual air quality sensors for measurement and control of air quality (gases and aerosols), air quality can be accurately determined. In the automatic mode, the system automatically selects the appropriate speed to ensure the high quality of indoor air. The 15W high power UV light can kill within 1 hour 95 % of the bacteria and viruses in the indoor area of a 30 square meter room. (1) Producing reactive oxygen species: In case of negative oxygen ions, the oxygen molecules are activated effectively in the air such that they can be actively and easily absorbed by the body. This is an effective method to prevent “Air-conditioner sickness”. (2) Bacteria: The anion generator produces a large volume of negative ions and small quantities of ozone. The content is equivalent to less than 50 ppm of the target value of the device. If the easily adsorped viruses and bacteria are combined to make changes in the structure or energy transfer, it leads to their death. Enjoy the fresh air after quick cleaning. With high acceleration of speed output of the AirJet 500, you can improve the quality of air and experience the true quality of life. CADR is the international comparative value of the most important indicators of air cleaning efficiency. The higher the CADR value, the higher the efficiency of air purification of an air filter system in comparison to the air filtering of a respirator. The Clean Air Delivery Rate (CADR) of Airjet 500 is 442 m3/h . 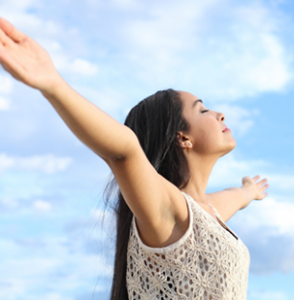 The AirJet 500 air filter produces up to 8.5 cubic meter of clean air every minute. In the “Ultra High Speed” mode, you can clean 42 square meters of ambient air of different smells, smoke, dust and VOC gases as well as of different types of bacteria and viruses and other air pollutants in 30 minutes. 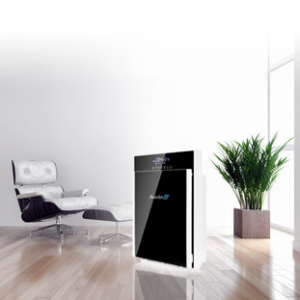 Ultra-Fast With its high performance, the AirJet 500 air purifier produces up to about 500 cubic meters of clean air per hour. In the “Ultra High Speed” mode, the AirJet 500 manages to free up to 50 square meters of large halls in about 30 minutes by its fast processing of odours, smoke and other air pollutants. If the system is running at a low speed, the maximum volume is 26 db , which is equivalent to the sound that is generated when someone whispers. A brushless DC inverter motor, which is an internationally advanced technology, is installed in the AirJet 500. Its advantages are its small size, high efficiency, long life, low noise, low vibration, low energy and high energy efficiency. The automatic display provides information on the change of filter units. Delivery time is 4-5 working days. To place an order please phone us on 01938 556800. We accept payment by credit / debit cards, cheques or bank transfers.